Meal plans are the backbone in any campus dining program and they can be a key influencing factor when students decide whether or not to live in on-campus housing and/or to participate in the campus dining program. PKC can help your campus develop flexible, customer-friendly and modern (versus old-school) meal plan programs that eliminate dissatisfaction, grow participation and add significant value to your campus dining program. Master planning is an analytical and creative activity that results in a coordinated set of decisions about actions to be taken to accomplish stated goals. Research has shown that the master planning process can yield meaningful benefits to higher education dining organizations that take the time to develop these strategic roadmaps. Our firm has created comprehensive master plans for dining and auxiliary service departments on college campuses, hospitals and medical centers, business and industry organizations and more. Over the years, we have found that many campus administrators consistently undervalue their foodservice contracts and enter into agreements that leave significant program opportunities and capital investment dollars on the table. PKC will work as your independent agent to facilitate a proven competitive bid process and negotiate on your behalf in order to secure a new foodservice contract based on the optimum, next generation dining program. Through our proven process, we’ve significantly improved and expanded the student dining experience while profoundly increasing the financial return for our clients. Our process takes approximately three to six months and has worked 100% of the time. We believe that it’s critical to begin the operator selection services process by completing independent and objective market research on your campus. That research allows us to develop the optimum dining program for your campus and to determine what your financial opportunity may be. We articulate this in a detailed and well-developed RFP that requires all potential operators to bid on what the best program is for your campus or organization. Construction Administration including reviewing submittals of buy-out equipment specified and shop drawings of custom fabricated equipment. On-site project inspection during the installation of foodservice equipment and upon completion of the installation. 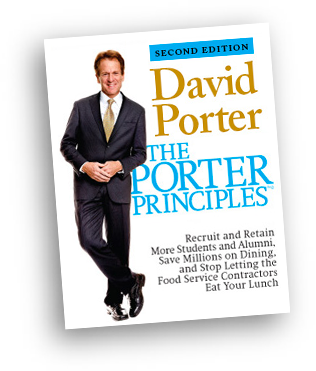 In the second edition of The Porter Principles, PKC CEO & President David Porter created a thought revolution. David provides additional intriguing insights and keen observations regarding the importance of unlocking the social architecture on campuses, the role it plays in guiding students and parents in the college search and the impact a socially-rich campus life can have on creating a stronger future for the younger generation. PKC has exceeded our expectations by helping FSU become a very engaged campus. Their professionalism, expertise and partnership have been invaluable in the creation of an outstanding dining program at Ferris State University.